This is probably the geekiest confectioneries I've seen to date and that's saying a lot because I usually stuff my mouth with anything sweet until I lose consciousness. 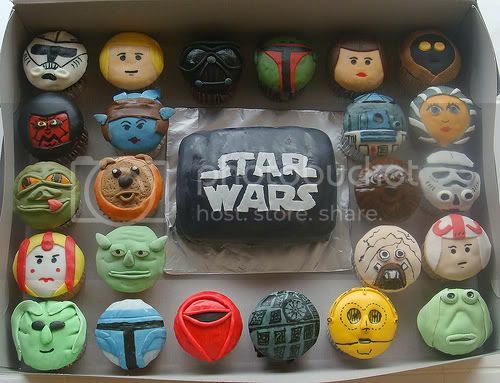 We've seen Warcraft truffles make their way into sweet existence but now we have Star Wars characters showing their sugary presence in these beautifully designed cupcakes. I'm sure Flickr user lclllc used up all his or her patience just to whip this up and have the presence of mind not to gobble it up before taking pictures. I wonder if somebody's interested in doing Street Fighter Cupcakes?